If you’re wondering why you might want to upgrade to Windows 8 on your current Windows 7 machine, Microsoft has provided a few good reasons. 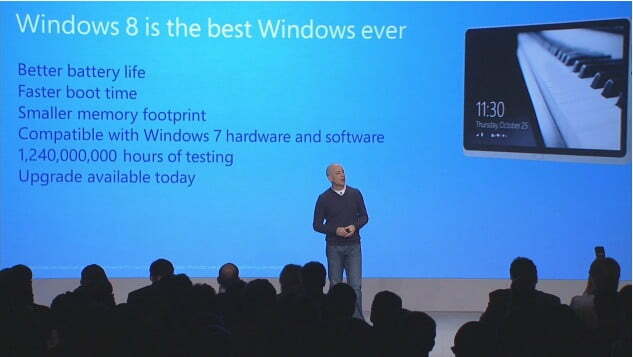 During its Windows 8 launch event in New York City today, Windows 8 chief Steven Sinofsky argued that upgrading a Windows 7 PC offers a number of immediate benefits including better battery life (13 percent), faster boot times (up to 45 percent), and a smaller memory footprint. That performance boost might just be enough to tempt you to adopt the new OS and learn how to navigate the new touch-friendly interface. If you’ve been looking for an incentive to put up with that new Start Screen then this could be it. The upgrade is available today and in the U.S. it will cost you $40 if you already have Windows 7. The new Windows Store has also opened its virtual doors and Microsoft has pointed out that it has more apps than its competitors did upon release, although that will be small comfort for early adopters. The big question is: how fast will it grow and how many developers will embrace the new platform? The software has undergone a record-breaking 1.24 billion hours of testing. Over 1,000 new PCs have been certified for use with Windows 8. Head to Microsoft’s website if you’re game for the upgrade. You can get it for $40 right now, or you can shell out $70 to get a copy of Windows 8 Pro shipped to you. Chromebooks are an intriguing branch of laptops that are often cheaper and faster than their Windows counterparts, but they are a little more limited. Intrigued? Here's everything you need to know about Chromebooks.